Impossible. It’s like saying “never” isn’t it? And the advice always was “never say never”. Now I am not superstitious, I don’t care about black cats, walking under ladders, or jinxes. I am careful to never say never. Most parents have this experience, before we had children we would walk through the grocery store and hear and parent and child and think “I would never treat my kid that way, what is that parent doing to that poor child.” Now I walk through the grocery and think “What is that kid doing to that poor parent?” Or really, “Wow, that parent needs a break, I so get that”. I need a break right now, but a break is not in the cards for me for a while. There is a lot to juggle and I will do my best, and it feels impossible. Sometimes life is so overwhelming that staying upright feels impossible. It is common, as a pastor, to hear from people, when they are wading through the depths of hell, that their faith in God is questioned. Or maybe even find it impossible to believe in God anymore. I will hear “If there is a God then why…” fill in the blank. I don’t know why, and honestly, I’ve never found why questions very helpful to me in life. They are unanswerable when it comes to pain and suffering. So I try to avoid asking them. But questioning God or even the existence of God is good in my opinion. It’s healthy in the midst of pain. Go for it, but here’s also what I believe, that in the midst of pain and suffering I believe more deeply in God’s presence. Because I believe in the resurrection and the life. I believe in the God of overcoming impossibility. It’s like Alice in Wonderland. I believe in the impossible, not because I can make it happen (although I might die trying…) but because nothing is impossible for God. I am hopefully optimistic, it’s who I am, but I am also willing to admit when I have had my fill and need a break. Things may not be impossible for God, but there are impossible things in our world. Despite all of this, I think I’ll take up the Queen’s ritual and believe as many as six impossible things before breakfast and maybe get a little closer to God in the process. 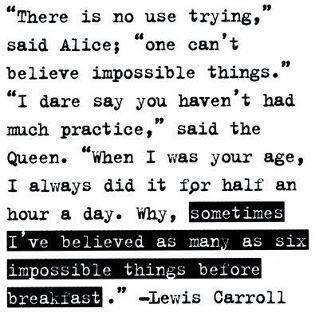 This entry was posted in Ministry and tagged alice in wonderland, impossible, life, Matthew 19. Bookmark the permalink.